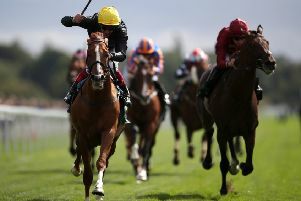 Jonjo O'Neill junior confirmed his prowess when winning on Chic Name at Newbury. AS the veteran Noel Fehily ended his career with an emotional winner at Newbury, Jonjo O’Neill junior’s high-profile double reaffirmed his continuing emergence as one of jump racing’s young pretenders. Already buoyed by a Cheltenham Festival win earlier this month aboard Early Doors, the young rider’s patience and horsemanship were the hallmarks that saw his fearless father Jonjo become champion jockey. Jonjo O'Neill junior completed a first career double when Annie Mc won at Newbury. Though the younger O’Neill has, just like his father, suffered his fair share of injuries, he is rapidly making up for lost time and is already coming to the notice of other trainers. This was exemplified by Chic Name’s gutsy success in the handicap chase to set up a possible trip to Sandown for a shot at the season-ending Bet365 Gold Cup next month. “Jonjo gave him a cracking ride and that did the business. I was gutted he didn’t get in the Cross Country Chase at Cheltenham, but that was compensation,” said trainer Richard Hobson. Noel Fehily walks out to the Newbury paddock before his final ride which saw the 43-year-old record an emotional victory aboard Get In The Queue. O’Neill then rode his father’s Annie Mc – schooled by Love Island reality TV star Chris Hughes – to victory in the feature novice hurdle for mares. “I’d say riding a winner at the Cheltenham was the biggest day, but that completed my first double. It has been a great day,” he reflected. As for the victorious trainer – and father – his post-race reaction was, as always, modest about both horse and jockey. “We’ve no plans. We might look at Punchestown, but she has been busy so maybe we will leave her off. She might go chasing next year,” he said. The O’Neill family then joined the rest of National Hunt racing to salute 43-year-old Fehily, who brought a long and illustrious career to an end in the best possible fashion when Get In The Queue ran out a ready winner of the Bumper. Fehily – who announced his intention to retire from the saddle when winning at the Cheltenham Festival the previous week – has been one of the most popular members of the weighing room for the past two decades. “It’s fantastic. Obviously we came here with a plan for him to win and I would have been very disappointed if he didn’t. “He is a very good horse and is going to be one of the ones I’m going to really miss next season,” he said after his swansong ride. “My career would have been deemed a failure if I got beat on him as a 1-3 shot. The winner was trained by a visibly relieved Harry Fry who said: “I said to my wife Ciara last night, ‘I can’t cope with this happening, not going right’. “She said, ‘you thought he was going to win the Champion Bumper last week, so calm down’. Nicky Henderson has effectively conceded defeat in his attempt to retain his crown and claim a sixth champion jump trainers’ title. 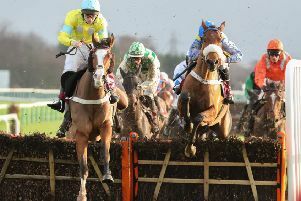 He trails leader Paul Nicholls by more than £400,000 and admits he faces an uphill battle in clawing back the deficit in the final five weeks of the season. Heading Henderson’s team for Aintree could be dual Queen Mother Champion Chase winner Altior, with a step up to two and a half miles for the first time under consideration for the nine-year-old in the Grade One JLT Chase. Harry Cobden recorded his 100th winner of the current campaign – the first time he has reached the landmark – when Saintemilion won at Exeter.